As a conference destination, Limpopo has a variety of offering. The province is blessed with ample natural resources, including 50 odd provincial reserves and many private game reserves. 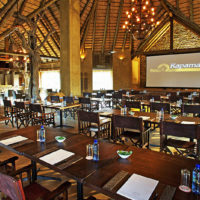 Limpopo comfortably caters for large conferences. Large and small conference venues are scatted all over the province. Limpopo conference venues have the added advantage of been close to the big 5 allowing for breakaways that are exciting.